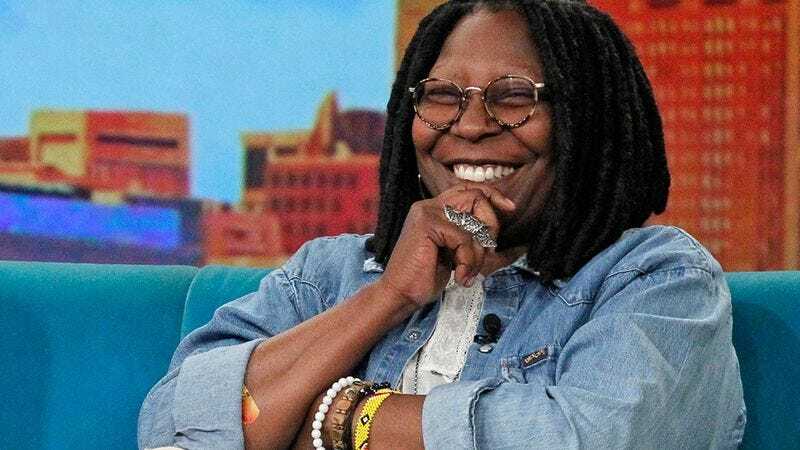 Whoopi Goldberg will soon be seen trapped in an elevator with Charlie Sheen and Luis Guzmán, but that’s not the cause for her recent meditations on pain. In an interview with Vanity Fair, Goldberg said that discussions with her granddaughters about their menstrual cramps (as well as previous personal experience, presumably) inspired her to go into cannabusiness for herself—she’s launching a line of medical-marijuana products designed to alleviate period pains next month. Goldberg has championed cannabis’ medicinal uses for years, even writing about her “love story” with her vape pen and herb for The Cannabist in 2014. She wondered if the weed she vapes for her glaucoma headaches could be used to treat menstrual cramps, then she checked with industry experts to see if any medical-marijuana companies had tapped into that market yet. Despite potentially appealing to half of the world’s population (at least, the menstruating portion of it), the experts told her the idea had probably been deemed too “niche” by previous ganjapreneurs. So Goldberg prepared to “kush” in on the untapped market, and teamed up with Maya Eastman, the owner of the female-run medical-marijuana company Om Edibles to found Maya & Whoopi. The company will offer cannabis edibles, tinctures, and topical rubs, which Goldberg claims can be discreetly applied by women at work. But if you’re worried you’ll giggle over your Excel spreadsheets at the office, Maya & Whoopi also offers cannabidiol (CBD) products which “[lack] the euphoric effects commonly associated with marijuana.” The THC-infused TLC can also be enjoyed at a more leisurely pace in a “profoundly relaxing” bath soak. The product line officially launches next month, though its wares are currently only sold in California.